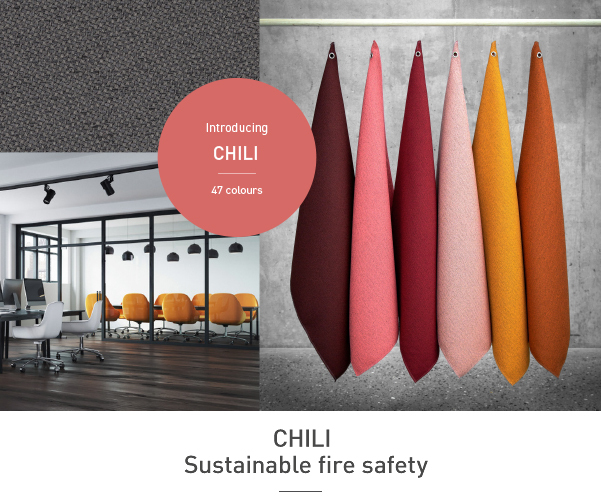 Chili is a pioneering upholstery fabric distinguished by its fusion of sustainable materials and exceptional fire resistance. Made from 75% post-consumer recycled flame retardant polyester, the fabric sets new environmental standards for fire retardant fabrics. Made from post-consumer recycled flame retardant polyester, Chili offers superior flame retardancy and is designed for use in environments, where fire safety is an absolute top priority. Chili meets even the most stringent flammability requirements. Please contact us for more informations and samples!